A selection of the best UEFA Champions League items is now live in FIFA 19 Ultimate Team. Find out the new Road to the Final squad, available for a limited time, and the UCL Live items you will be able to find in packs. You can see all RTTF upgrades clicking here. Every UEFA Champions League-eligible player who has been confirmed by their club or made an appearance for their club in this year’s tournament receives a Champions League card with +1 to their overall rating (OVR) and each of the six main stat categories. cMOTM items are split into Champions League MOTM cards and Europa League MOTM cards, depending on the competition where the player stood out. These items don’t have any periodicity and are usually assigned for standout performances in Champions League fixtures. FIFA 19 Squad Building Challenges cards are unique items that players can get completing specific Champions League challenges. They can’t be found in packs. These cards are only available as rewards and for that reason they are untradeable. 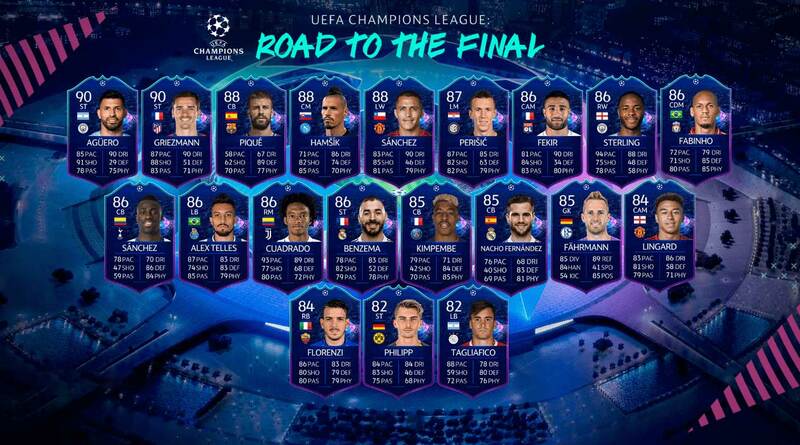 TOTT cards assigned to the best players of European Champions League – Team of the Groups Stage (TOTGS) and Team of the Knockout stage (TOTKS). The ratings and attributes of these cards are usually boosted in one or two points, compared to their previous card. The UEFA Live items are assigned to a very limited selection of players who are playing the Champions League. 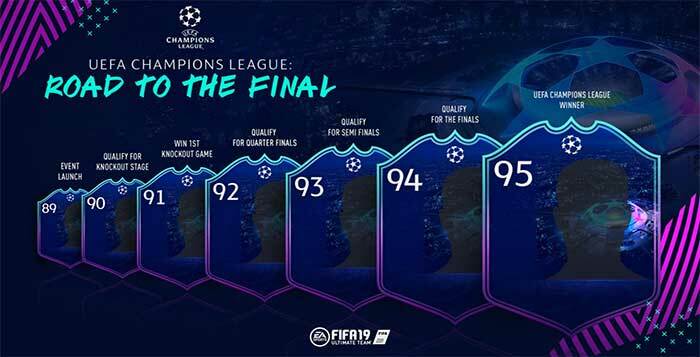 These cards replace the regular UCL player cards in specific times and boost in rating and stats every time their team progresses to the next stage. What are the FIFA 19 UCL Live Items? The UCL Live Items are the most important Champions League cards because they are the only Dynamic items. If you know how OTW cards work, you already have a good idea about these new cards. First of all, you should know that UEFA Live items are assigned to a very limited selection of players who are playing the Champions League. 21 UEFA Champions League Dynamic Items that will be available in packs for a limited time, while 4 UEFA Europa League Dynamic Player Items will be available through SBCs, throughout the event. It’s important to clarify that regular ones to watch cards are not affected by UCL Live upgrades. In the same way, when a new TOTW or special card is released, the respective UCL Live item is not upgraded. 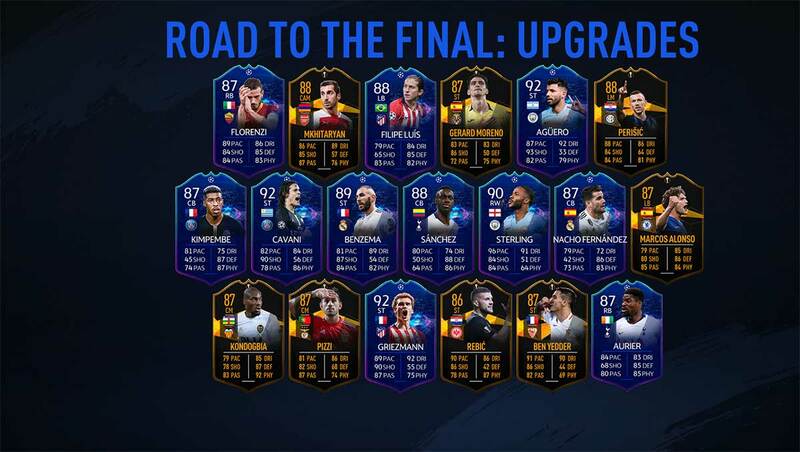 A: The Player Item will be updated to a UEFA Europa League: Road To The Final item, they will not receive a OVR upgrade for advancing to the Knockout stage but will continue to receive upgrades if their club advances to the other stages of the competition. Who are the players who got a UCL Live Item in FIFA 19? the upgrades for winning the first round in a knockout game , it happens only in the 1/8 finals ? or in all the knock out stages ? What happens if the first leg is a draw? Who gets upgraded? Nobody and both teams players just miss out on a +1? Nobody and both teams players just miss out on a +1. Exactly. We already have updated the images here. Hey Rodrigo, ucl kondobia , will he recovers a nation change or will he stay french? We believe he will stay with Central African Republican nationality. Hiii, if Kondogbia with Valencia go through his nationality will be changed with the upgrade??? In FIFA 18 they didn’t update nationalities but they usually do it. His nationality should be Central African Republic until the end of the game. So does it mean that for example Fekir right now dont lose his upgrades? I mean he only can get upgrades but no downgrades? Following the rules of last year, he can’t be downgraded. What happens to koulibalys CL card now? Does it change to a Europa league card? Koulibaly has a TOTGS item, so it won’t change. What does it happen to a player sold to a club which doesn’t play UCL or UEL? would like to know it aswell, i guess you’re referring to hamsik? He doesn’t receive any other upgrade. Technically as shown in the other webpages. It has nothing to do with hamsik? More to do with napoli proceeding? Shouldn’t hamsik still go up? As napoli proceed. The card will still be a napoli card? Where does it say this? According to EA a lot of things. EA have made a big flaw in this system and have made false promises in other places! This is ridiculous. If Borússia win against tottenham will pulisic get a +2 overrall boost because he is just an 84?? Do players like perisic and hamsik that have been knocked out get an overall boost if they keep advancing in Europa league ?? Exactly. You can see all the potential upgrades here. Everywhere it says it doesnt matter even if Hamsik plays or not. It is mainly based on Napolis performance. So why is it that Hamsik transfering would mean his rttf card doesnt go up? Define ‘everywhere’, please. EA says that “If a player transfers to a club not playing in either tournament they will no longer receive any upgrades.” We believe that EA is most reliable than any other ‘source’. I want Sokratis Special Card in my squad. When i buy Sokratis OTW does he get also an Upgrade when his EL Card gets in the next round? Question: I have Douglas costa, what if they win and his overall increases will his max buy it now price increase as well? Or is 600 the cap? 600k is the maximum right now. EA may change it at any moment. If people start selling him by +550k, then EA will probably increase his max price range. Can telles can an upgrade if he does good for porto but not in champions league? RTTF items are only affected by the team’s form on UCL and Europa League tournaments. Again. The teams performance so hamsik? Except obviously if the player doesn’t make part of the club. What happens if for example van duh gets a winter upgrades does the love card also go up like informs? What happens if the first leg is a draw, is there no upgrades for this? What if player changes his club and his new club is in UCL or UEL advances, Will he get any club change? He will get an upgrade (officially confirmed) but it’s not 100% sure that he will also get a new club. What’s going to happen to Pulisic’s card now that his transfer is basically confirmed to Chelsea? Will he be converted to a Europa Live card or will he stop getting upgrades? According to EA, he will keep getting upgrades. will the card change to a chelsea card? if he transfers. Yes, we believe it will but it wasn’t officially confirmed. I currently have uel live kondogbia in my squad and I was wondering if it is possible that his nationality could be updated to congo. Because he plays for the national team of congo now. It happened in some past editions but not in FIFA 18. That’s the way how IF ratings works: Any card 85 rated or higher, only gets +1. A 84 rated cards is boosted to 86. Maybe Injury player for a month and can’t play tournament the round of 16 UCL. But he’s team go to quater final. he’s ucl card possible upgrade? Upgrades are expected to happen soon. Leroy Sane scored the two goals to make the 2-1 comeback win for Man City in the Champions League, can he get a UCL MOTM card? No. EA will not assign MOTM cards for this stage of the UCL. That price may also already being reflecting the upgrade. It is not confirmed if players are upgraded like IF items of just +1 to every single card. Hey Rodrigo, so Renato Sanches will have an upgrade equivalent to an inform, right? Does that mean he will go from 81 to 84 or just +1 ovr(81 to 82)? Olá. A EA publicou erradamente os dois modos e não respondeu aos pedidos de esclarecimento, pelo que só quando acontecer é que saberemos. what happens if, a player gets a IF will the UCL card just match the inform? for e.g fabhino gets a if for liverpool before they progress in the champions league? By IF do you mean a TOTW card? They have no impact in UCL cards. If a team loses their first leg of Round of 16, but still manages to qualify for the quarters. Does the player get +2 for reaching the quarters? Otherwise it would be unfair, because players of other teams, which won their first leg, get one more upgrade. Even though they achieved the same. Yes, in that case, the player only gets +1. How long are ucl live cards in packs? The dates are published in this page. They are no longer available. Is this truly confirmed info? Fabinho and Sanchez are risky investments if this isn’t true at all? Both Liverpool and Tottenham are currently and almost expected to finish third in their poule. Especially Sanchez is a bit risky at the moment, Tottenham could end up fourth if things go wrong. Anything can happen in that poule. Fabinho is a minor risk, but also Liverpool could end up fourth! Most of the people don’t know about this but yes, it is official. Does florenzi go from 84 to 86 in the first upgrade or 84 to 85? It isn’t clear but we believe he will go from 84 to 85. The upgrade is +1 every time the team of the chosen player gets the target which is needed for the player upgrade? Yes, it should work that way. We also agree that +1 for each stage is easier to understand. In fact, we thought we have changed it a few days ago but for some reason, it didn’t wor. Hi Rodrigo, first I want to thank you for all your hard I good work. I just got Kimbepe otw, should I sell? It cost around 165k right now in PS4. Or will it cost more if PSG reach the knockout stage? Just want your advice, this is the more expensive player I have got in fifa history(I am not lucky) and just want to take the best possible decision, thanks in advance. Hi. It isn’t an easy answer. No one can predict what will happen, especially when it is the first time that these cards are released. I believe it is a question of expectation. Most of the players are paying that price by this player because they believe he will reach, at least, the next stage. In other words, his price will probably not increase in the coming weeks. I believe it will only happen if he reaches the quarters but, as I said, it is only an opinion. Good info. What about the Europa League cards? Are any of those live to receive upgrades? 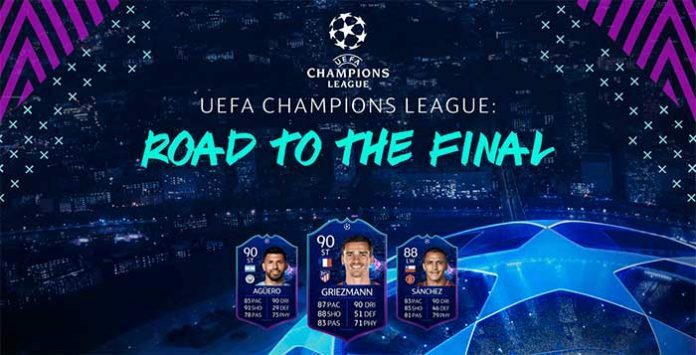 The Europa League Road to the Final cards are dynamic items too.